A cursory search for a Kilimanjaro Kit List on the web returns a number of unsatisfactory results that admittedly go some way in providing an overview of the key gear requirements, but fall woefully short in terms of explaining why and what is needed in detail. We know that for our readers the devil is in the detail, so a few years ago we set out to produce a complete and reliable Kilimanjaro packing list. 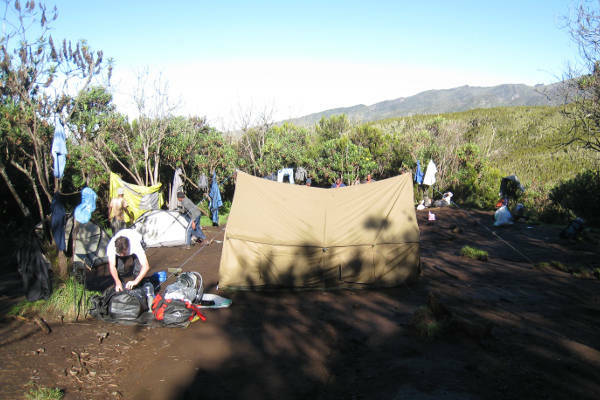 In browsing this Kilimanjaro packing list we recommend using the quicklinks on each page to jump to key sections, and bookmarking this page so that you can return to it as your preparations unfold. Please also share our list with fellow trekking parters, or link to it from your blog or social networks as a resource for future trekkers. Our Kilimanjaro gear list is split into a number of key sections. Use the links below to navigate to each section. Typically you get two types of trekkers on Kilimanjaro. Those who are unprepared and under-equipped, and those who have spent an arm and leg on equipment that they will unlikely use during their hike. In this Kilimanjaro packing list we hope to provide a happy medium between the two that covers all mandatory equipment that we recommend you should purchase in preparation for your adventure. If you happen to forget a few things you can usually hire from your tour company or buy equipment from the various hawkers who loiter outside the route gates trying to sell you everything under the sun. Remember if you decide to buy from these guys they will always try to overcharge. Bartering is just the way it is done in Tanzania. Here is a quick list of all the gear that you need to pack for your Kilimanjaro trek. To read exactly what type of gear to get, along with our personal recommendations, click the detail links below. The Western Breach is the most technically challenging approach to Kilimanjaro. It was closed for a short period in early 2006 after a fatal rockfall claimed the lives of three trekkers. It has however re-opened with a new and safer route configuration, and is steadily growing in popularity. For trekkers interested in the Western Breach we recommend reading our route description here. It is very unusual to need rope or a climbing harness. Again we recommend you confirm with your tour operator which Kilimanjaro kit list they recommend you bring should you decided to climb the Western Breach. Hi, I am in Tanzania now giving a fundraising workshop to an NGO. This was a last minute trip and i would like to climb Kilimanjaro. I was already on vacation when I planned this and did not have any climbing gear with me. Any chance I can climb Kili starting this weekend? Can I find the gear somewhere? Is it too late? It is not everyday one comes to Tanzania so I would like to make the most of this trip. My flight back is from Nairobi on July 15. PS i am in good physical shape. Hi Marie-Claire, you should be able to find a local operator in Moshi or Arusha who would be willing to take you. There are gear rental shops in Arusha so you should be able to get all the kit you require. Cheers! Would you make any adjustments to the packing list for a 9-day Northern Circuit hike with Crater Camp? Hi Shaun, no, I wouldn’t make any changes, although you may want to bring an extra pair of underwear / socks. Go to the gym 2-3 times a week. Hi Evelina, you sound like you are fit enough to tackle Kilimanjaro. The key, in addition to physical fitness is mental endurance. 7 days hiking at high altitude is tough work. Summit night is a real mental challenge. If you are strong mentally then I think you have a great chance to summit Kili. All the best! Good point Charles, I’ll add this. All tour companies should provide their guides with complete first aid kits as well. Thank you thank you thank you for this spectacularly comprehensive gear list. I run, hike, and ski a bit, so I think I may have almost all the recommended clothing already. My one question is regarding the “warm jacket” aka “core jacket.” I’ve got a hooded GoreTex waterproof ski shell which I planned to take for wind and rain protection. For summit night, I planned to wear the shell layered on top of a fleece, plus my underlayer. Will this be sufficient, or is there any reason I would need anything more? Hi BCM, this should be more than sufficient. All the best!